98203 S. Bank Chetco River Rd. I have stayed here several times. The staff is friendly and helpful. I stay in pull thru sites and they are concrete, level and both my 5th and tow fit in site which has picnic tables. It is right on the Chetco river and you can walk your dog on nearby sand bar and my lab also swims in the river. It is slightly inland and gets the sun before Brookings. 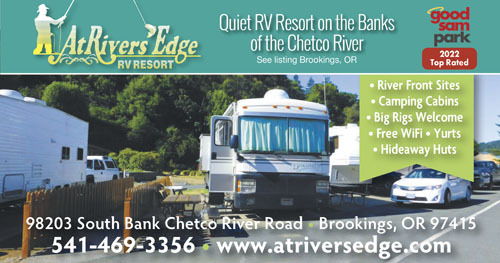 I think this is the nicest RV park in Brookings area and would recommend it to anyone. I didn't actually stay at the RV park. I had made reservations several weeks before my expected arrival. Two days before my reservation date I was called by the park and told that they were cancelling my reservation due to the possibility of fire in the area. I had no problem with this. It just meant finding another park and driving a little farther. I had given the park a $50 deposit when I made my reservation. Several weeks later I received a refund check for $40. I was puzzled as to why I wasn't given the full $50 so I called the park to ask. The person answering the phone knew about the cancellation but told me I would have to talk to the park's owner who was "out-of-town until next week". I waited and called again the next week, asking to speak to the owner. I was told she was not available. I left my contact information but didn't receive a call back. I actually called the park six or seven times but was never able to speak to the owner. I received an e-mail from her with the refund policy on cancellations. I didn't think that this policy should apply to me since I didn't cancel the reservation (they had). I called again. I did receive a message on my phone telling me that they would not be refunding the $10. Why, I will never know. I don't understand why I should be penalized when I didn't request the cancellation. I realize that it is only $10 but that means every reservation during that period was charged that same $10. I'm not the only one. It seems that they made a lot of money. This is a lovely location. My site was facing the Chetco River and it was quite beautiful. I was treated to a beautiful display of water fowl and changing tides throughout the day. The park is well maintained and it appears that the long-term residents are situated in their own area of the park. I would not have rated the bathrooms as highly as Good Sam does, however. While they are clean, the men's shower is a common towel dry/dress/undress setting. There are private showers which are coin operated (1 quarter = 8 minutes). There is enough space that they could remodel and create a private dress area for each shower. I elected to shower in my rig instead. Other than that, it was a very pleasant stay and the staff was most helpful. As is this case with some other RV parks, there aren't enough toilets. If the bathroom situation isn't a concern, I'd highly recommend this location. Excellent is the best word to describe this park. 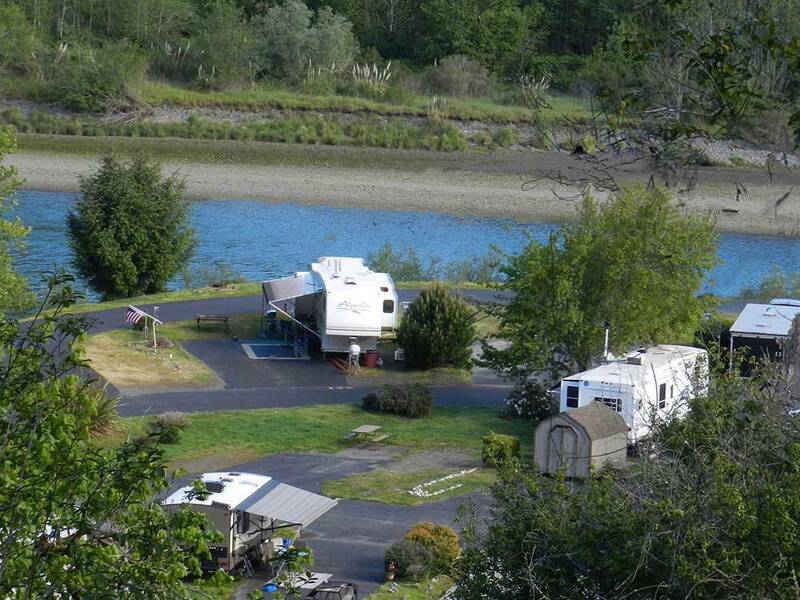 Beautiful location and setting right next to the Chetco River. Fast, friendly, and efficient check-in. Very accommodating as we needed to check out late and that was no problem. Quiet location. Wifi was very good. One thing to be aware of is that the road down to the park is one lane in places, but no problem for any size RV.